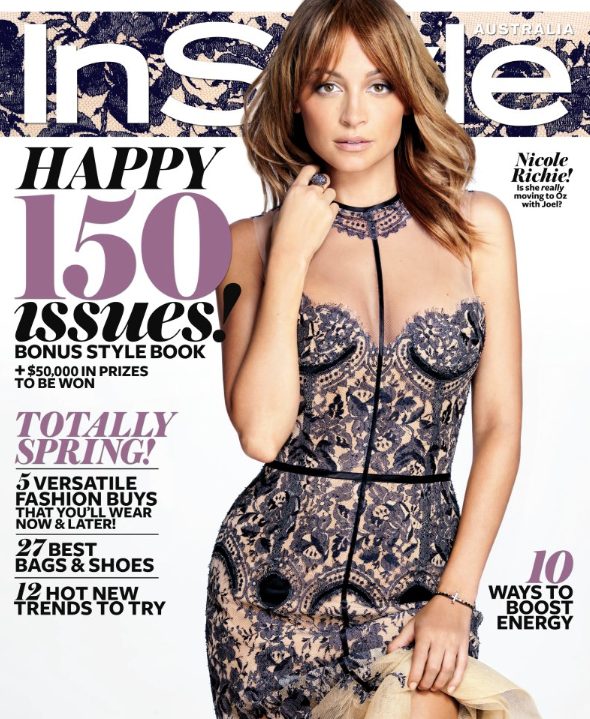 Nicole Richie is looking fabulous on the September 2012 cover of Australia InStyle in a lace body con dress. Nicole Richie wears a Zim clique links dress by Zimmerman. According to some excitable media reports, you and Joel are settling in Sydney, enrolling the kids in school, and stocking up on Vegemite. True or false? "[Laughs] Right! To be honest, none of us really like Vegemite; it's an acquired taste, I guess. As for whether we're relocating to Sydney, it depends on how much Joel will be working there. Our family is here and this is always going to be our home. Do we want to have homes elsewhere? Absolutely. I have a strong love for Sydney, and I've always had a sort of attachment to it. I love the beaches and the friendly people." Both your accessories line and your apparel collection emit a bohemian vibe that recalls the '70s. How do you get inspired when designing? "My inspiration always starts with music. There's a real connection between fashion and music, and each season I try to bring the two together. There's a certain feeling, a special place in your heart, when you hear a song you love. I try to tap into the same feeling through my clothing. I don't have muses—it's not so literal—but I'm obviously inspired by the music of the '60s and '70s. I love the overall freedom of that time. The idea of clashing didn't exist, and you were able to freely mix fabrics, prints and colours." On The Voice, Joel had boundless energy, jumping up from his chair, pumping his fist and elatedly sharing his thoughts. Is he like that at home? "He can be, for sure. It was great seeing him have so much fun. Remember that this is something he is so passionate about. Joel and [twin brother] Benji have really struggled to get where they are and they came from nothing. This project, and being a mentor to struggling singers, was something that really hits home for Joel. The overall excitement stems from the compassion and heart he feels for these artists." You make time to dance as part of your workouts with Tracy Anderson. What changes have you noticed in your body? "It's about toning. What's so great about Tracy is that she designs a program especially for you, for your body, and helps you get to the best version of yourself. I grew up a dancer so the dance-cardio element of her approach was a draw for me. You get to dance for an hour and then you do some legs, arms and stomach. You never do the same thing twice. I work out two or three times a week." Pick up InStyle magazine on newsstands now to see more of Nicole Richie's feature. Img source - Instagram & Zimmerman.